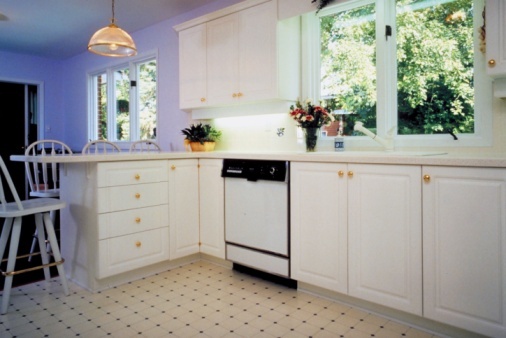 Ceramic stove tops allow the homeowner to prepare food on a smooth, shining surface. The surface remains shiny with proper daily care and treatment of stains. Cleaning cloudy rings on a ceramic stove is not a difficult task if you use the correct cleaning tools. The cloudy rings result from pots or skillets boiling over and leaving residue on the smooth ceramic surface. Using a stove-top cleaner recommended by the manufacturer is one way to clean these unsightly rings. A sponge helps to clean cloudy rings off of ceramic stove tops. Soak a clean sponge with warm water, then wring it out well. Sprinkle a generous amount of baking soda onto the damp sponge. Baking soda is a nonabrasive cleaner that will not scratch ceramic stove tops. Rub the sponge and baking soda in a circular motion over the cloudy rings until they disappear. Rinse the sponge under warm running water, then wring it out. Rinse the ceramic stove top with the sponge until none of the cleaning solution remains. Wipe the ceramic stove top dry with a soft, lint-free cleaning cloth. Squirt a quarter-size amount of the commercial cleaner on the cloudy rings. Rub the cleaner into the rings on the stove top using a sponge, working in a circular motion. Apply more of the cleaner onto the cloudy rings if the stains are stubborn. Cover the area with a damp cleaning cloth. Allow the damp cloth and cleaner to remain on the cloudy rings for approximately 30 minutes. This allows it time to loosen the stubborn stains. Rub the area with the damp cloth, wiping off all cleaner residue.